In a recent video on using the Ontario Well Records Map, I cautioned that a good flow test on a well done during the spring melt in March wouldn’t necessarily mean a good flow rate during the dry summer months. After posting the video, I was asked whether I had evidence to support this claim, or whether it was just an assumption on my part. Here’s the method I used to arrive at my conclusion. Using the provincial well records database, I found that there were 5,105 domestic well test records in Prince Edward County between 1950 and 2017. I classified these by quarter based on the month of the test, and calculated the percentage of new wells which met the County’s severance requirement of 3 gallons per minute or more. 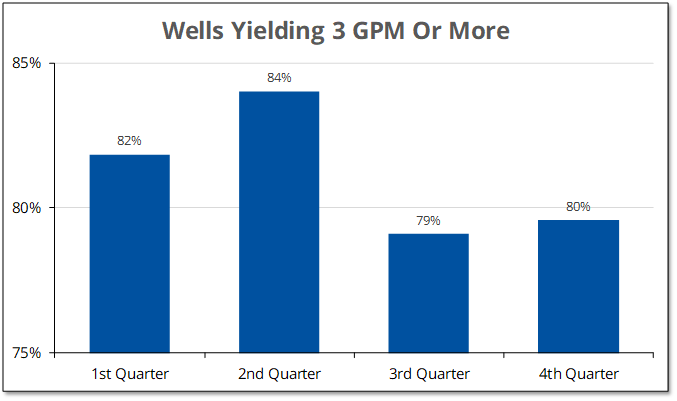 For wells drilled during the second (spring) quarter after the spring melt, 84% of wells delivered 3 GPM or more. During the third (summer) quarter, 79% of wells delivered 3 GPM or more.